The One Ring is the central theme (in some ways the central character) of JRR Tolkien’s The Lord of the Rings trilogy, and Tolkien has left us much to ponder on deeper meanings of the One Ring. Many have observed The Ring as a metaphor for sin, and I agree…but I also see something more. The ring is inherently evil, corrupting the heart of not only those who bear it, but also those in close proximity. The ring has great power, but only to destroy, not to create or improve. The ring is addictive…only two bearers ever gave it up willingly and they with great difficulty. So far so good…the sin metaphor holds up…but let’s dig deeper. We are also told that all of Sauron’s power is bound up in the ring and that so long as the ring exists Sauron cannot be completely destroyed. So we see that the ring is more than sin…it is also the power of sin…and the basis for satan’s power. Of all the objects Tolkien could have chosen as a token of Sauron’s power, he chose a ring. Throughout history and even today, a ring represents covenant relationship. A wedding ring is more than a piece of jewelry…it represents the marriage relationship. Historically, signet rings were given to trusted advisors of kings, giving the ring-bearer the full authority of the king. Rings are also used to signify membership to elite groups, such as fraternities, alumni associations, sports teams, or secret societies. In LOTR, Sauron gave rings to nine kings of men. The rings gave the men power and authority. However, Sauron deceived them by making another ring that bound the power of their rings to himself. The rings granted covenant authority while also binding in covenant. The ring-bearers did have power, but they were also enslaved…deceptively enslaved. 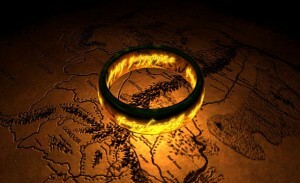 The One Ring, forged in secret, bound them to the lord of the rings. The One Ring is the covenant forged in deception. Through this story, Tolkien has wonderfully illustrated an oft-overlooked biblical truth. Mankind’s problem with sin runs much deeper than the accumulation of individual battles with personal sin. It is an inherited relationship with the kingdom of darkness. Much as the One Ring gave Sauron power over Middle Earth, similarly Adam’s covenant with darkness has given satan dominion over the earth. Much as Sauron’s power could only be destroyed by melting the ring, similarly satan’s power can only be destroyed by dissolving mankind’s covenant with evil. It is for this purpose that Jesus became a man and suffered death on the cross. Jesus came to redeem us from Adam’s covenant with the kingdom of darkness…to cause that covenant to be dissolved. Much as Frodo traveled to the heart of Mordor to destroy the ring in the fires of Mount Doom, similarly Jesus entered Sheol to redeem us from Adam’s covenant with the kingdom of darkness. Much as the destruction of the ring ushered in the return of the king of Gondor, in redeeming us from the kingdom of darkness, Jesus also cut a new covenant by which we can become heirs of His kingdom. The time in which we now live is between the Advents of Christ. Jesus has come to redeem us from the power of sin and to deliver us into His kingdom. He has not yet returned to claim His inheritance and dominion over all the earth. During this age, His work is activated by mankind on an individual basis. We can either accept His redemption and deliverance, or we can remain enslaved to the kingdom of darkness. The choice is ours. We can remain enslaved to the kingdom of darkness or we can choose to become heirs of the Kingdom of Heaven. We can be ruled by sin and death or we can choose life through the righteousness of Christ. This entry was posted in free will, God's Position toward Us, Redemption, Tolkien's Wisdom and tagged christ, covenant, frodo, Jesus, jesus christ, jrr tolkien, kingdom, lord of the rings, lotr, mordor, one ring, redemption, sauron, the one ring, tolkien by joe. Bookmark the permalink.